BE ENCOURAGED TO EXPRESS YOUR FAITH, PRACTICE IT DAILY, AND ACT ON BEHALF OF OTHERS. Join Doug Barr, Director of Christian Education at Farmington Presbyterian Church, and Sameer Mansour, of Memphis Islamic Center, in a retreat to bridge the divides between Muslim and Christian communities. There will be times of presentation, dialogue, and intentional prayer. Lunch is provided. 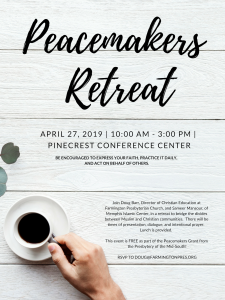 This event is FREE as part of the Peacemakers Grant from the Presbytery of the Mid-South!